Red Beach Surf Club will play host to surf canoe crews from the Northern Region when the Canoe Training Day takes place on Saturday 27 October. 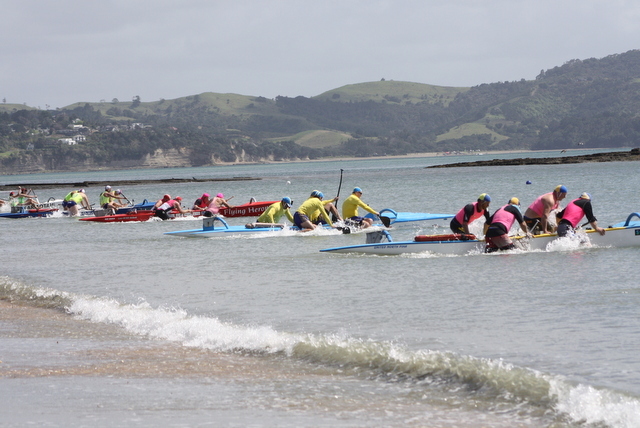 Jointly sponsored by The Flying Herons and Cornish Truck & Van, the event will give established crews the opportunity to blow out a few cobwebs and provide new paddlers with the chance to experience the sport before the surf carnival season gets into gear. It was first held in 2011 in response to a resurgence of surf canoe racing in the Northern Region. It attracted 31 crews from seven clubs. For the first time there will be a division for U16 paddlers which is viewed as a positive move to encourage novice paddlers and those who have recently obtained the Surf Lifeguard Award. The other divisions for male and female crews will be Open, Masters and U19. All will compete over a five-race series. Wrapping up the day will be the Great Crate Mixed Club Race with crews comprising of two men and two women. Crews will get a Le Mans style start and will compete for ‘The Crate’ which will be filled with a worthwhile assortment of goodies. Cash prizes will be up for grabs in all age divisions. The day will conclude with a BBQ, Mix ‘n Mingle and refreshments in the Red Beach clubrooms. For more information, contact Noel Kay at 027 388 5585 or Megan McKenzie at 021 277 6787.